The Congress chief said PM promised depositing Rs 15 lakh cash into their accounts by bringing (back) black money stashed abroad, but that remains unfulfilled. Congress chief Rahul Gandhi today said that Prime Minister Narendra Modi has betrayed the people, claiming that he had not fulfilled promises of providing two crore jobs every year and "depositing" Rs 15 lakh in their bank accounts. The Congress chief was addressing a rally at Sagar in Madhya Pradesh, where assembly polls will be held on November 28. "Modiji has betrayed the people on the issue of providing jobs to two crore people every year and depositing Rs 15 lakh cash into their accounts by bringing (back) black money stashed abroad," Mr Gandhi said. PM Modi, during the 2014 Lok Sabha election campaign, had prominently highlighted the issue of black money and had promised to bring it back. 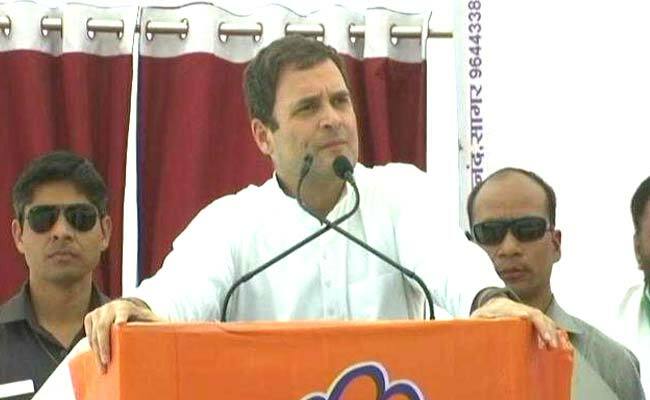 The fear of losing the 2019 general elections has created "hatred" in Prime Minister Narendra Modi's mind against the Congress, Gandhi said addressing another rally at Damoh later. The Congress chief said while Madhya Pradesh Chief Minister Shivraj Singh Chouhan speaks with decency, PM Modi lacks it whenever he attacks the Congress and his family members. "When you hear Modi's speech, he uses wrong words and speaks with hatred... and also speaks lies. The faith reposed by the people and youths in them has broken. Now, when Modi comes, people say he will speak lies," Mr Gandhi said. "He (Modi) speaks with hatred about me and my family, but Shivraj uses decent language. Modi doesn't know how to speak decently, but Rahul Gandhi will always maintain decency while speaking," he said. "Though Chouhan has indulged in corruption, whenever he says anything against us, he speaks with decency," Mr Gandhi added.